About a year or so ago, I was browsing Hulu looking for a new anime film to watch. I noticed that Fuse: Memoirs of a Huntress had been added by TMS Entertainment as a subbed release but didn’t find too much information about it beyond a quick synopsis. Despite limited background information I decided to give the film a shot and found myself quickly drawn in by the eye catching animation and enjoyable storyline. I wasn’t sure if Fuse would gain the same level of notoriety as some of the other feature length anime out there, but earlier this year NIS America announced they had licensed it for North American distribution and were giving it the Premium Edition treatment. Now that I’ve had the chance to watch it again I still think it’s a really enjoyable film that more people should watch, even if a few of the story elements seem to come together a bit too conveniently. Fuse: Memoirs of a Huntress is based off Kazuki Sakuraba’s book Fuse Gansaku: Satomi Hakkenden, which itself is an adaptation of the famous Nansō Satomi Hakkenden story. It tells the story of a huntress named Hamaji, who lives in the mountains by herself after her grandfather was eaten by a bear. Early on a message arrives from her brother Dousetsu asking her to go to Edo and live with him. Hamaji arrives and finds that the hustle and bustle of the city is much different and harder to take than the mountains, and gets lost because she cannot read. Along the way she runs into a crowd huddled around the severed heads of some dog like creatures, which are known as Fuse. Fuse are half human, half dog and are able to consume human life essence so they are seen as a threat and the shogun has offered a big reward for their heads. As you might expect, one of the first people Hamaji encounters in Edo is a Fuse named Shino, who is seen getting into a fight with some humans and fleeing from them. She unintentionally helps Shino and he shows her the way to where Dousetsu lives. Hamaji and her brother end up joining the Fuse hunt in order to try and make some money, and the story picks up from there. I don’t want to go too much further into specific details as it would give away too much of what happens, but let’s just say that Hamaji continues to run into Shino (who as it turns out is a theater actor) and the two find themselves becoming close despite the circumstances of the Fuse hunt. There’s also a rather strange sub-plot revolving around the real author of Hakkenden and his granddaughter, who have been worked into the film. Fuse: Memoirs of a Huntress is split between flashy action sequences and a good deal of drama, and it does a fairly good job of drawing the viewer in and making them care about what is happening on-screen. What I liked from the beginning was the level of detail in the backgrounds and the secondary characters, as it made me feel like the Edo being shown was a real location. It helps that I really like this particular era of Japan as a setting, and Fuse definitely does it justice. Although the majority of the cast plays a relatively small role, they all have their own quirks and ultimately help Hamaji throughout the film. The focus for much of Fuse remains on Dousetsu, Hamaji, and Shino, and all three are likeable in their own way. Dousetsu comes off as a bumbling swordsman who has a weakness for woman and alcohol but is dependable when it counts, while Shino has the opposite character type as he has a cool and calm demeanor as an actor but turns dangerously violent when his instincts as a Fuse take over and he transforms. Hamaji’s the type of lead character that I think viewers will root for, as there’s a sense of innocence to her because she comes from the mountains and can’t read, but she’s tough and showcases a good deal of determination. What’s interesting about Fuse is that it focuses on the dynamic between hunter and prey by using the half human half dog Fuse as the prey throughout the film, and also poses the question of whether non-human beings can peacefully co-exist in society or not. It’s not necessarily the deepest animated feature out there and does go for a more linear storyline filled with action and a touch of romance, but I liked the ideas that the film presented. There were a few flaws though, as the romance between Hamaji and Shino did seem a bit rushed and seemed just a little too convenient for the sake of the story, even if it did ultimately tug at my heart strings. I also wasn’t completely sold on the inclusion of the Hakkenden author as I didn’t feel it really added that much to the overall storyline. But despite this, after watching the film all the way through for a second time I still felt myself drawn in by what it had to offer and found that it does hold up after multiple viewings. As I mentioned earlier, the animation is what initially drew me in. Each scene is bursting with bright colors and showcases the beauty of the mountain setting and intricacies of the large city. The action sequences are also well choreographed and often have the characters running across roof tops or through the middle of the city in a way that further shows off the background setting in the process. The character animation takes a different approach, going for an almost cartoon-y look that gives them all very different traits and makes Fuse appear fairly different from a lot of the other anime I have watched in recent months. The soundtrack isn’t an element that particularly stuck with me, though there were a few songs that appeared at key moments to enhance the emotions of that particular scene. What did stand out was the voice acting though, as there are some big names in the lead roles. Minako Kotobuki (Tsumugi from K-On!) does a great job as Hamaji, and I’m sure that many of you will recognize the voices of Dousetsu and Shino from plenty of other roles. NIS America’s Premium Edition comes in their usual hardcover case and includes an art book. Considering how beautiful the animation is, this is definitely a release that benefits from having the art case and art book as the book is jam packed with sketches and still artwork that showcases both the characters and environments. NIS was also able to include an interview with the director of the film, which gave me some insight on what he was trying to accomplish with Fuse: Memoirs of a Huntress and how he approached certain situations. There aren’t any on-disc extras aside from some Japanese commercials, but this isn’t that surprising as this is fairly standard for anime NIS has licensed. Fuse may have a few story elements that seem like they were a little rushed, but it’s still an enjoyable anime film that held up on multiple viewings. There’s a sense of discovery and adventure as the viewer explores Edo along with Hamaji for the first time, and the dynamic that is explored between hunter and potential prey puts an interesting spin on things. 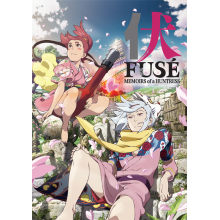 If you like fantasy anime with a healthy dose of action and a little bit of romance, Fuse is worth giving a watch as it will draw you in with its flashy production values and keep you interested with its likeable main cast. Fusé: Memoirs of a Huntress Premium Edition sets its sights on North America this spring!